During April, we were determined to get alongside Bowel Cancer UK and work harder to beat the 4th most common cancer, affecting 41,000 people every year. As you hopefully saw on our website, to highlight Bowel Cancer Awareness Month, we pledged to make a donation of 50p for every item purchased online and we’re delighted to announce that we raised nearly £100 which will go towards vital research! 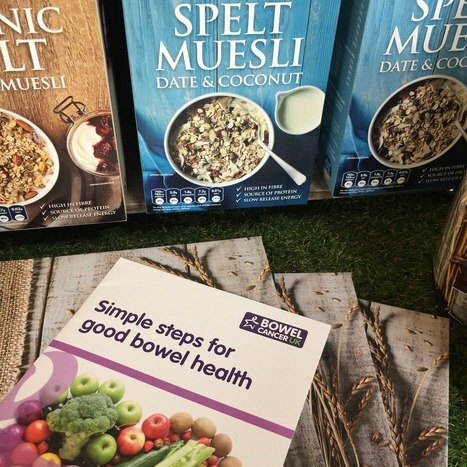 Diets high in fibre have been shown to help reduce the risk of developing bowel cancer and spelt is high in fibre; that’s where we step in. In partnership with Bowel Cancer UK, we put together a collection of Great British Spelt Recipes that encourage aspiring cooks how to use spelt in a variety of dishes, from risottos to muffins. If you didn’t get a chance during Bowel Cancer Awareness Month why not try our delicious recipes written by celebrity chefs including Mark Hix and Yotam Ottolenghi.